Brexit sinks as if above a political abyss, a Mariana Trench of unfathomable incompetence. They say if you give enough monkeys enough time with typewriters they’ll produce a work by Shakespeare. That may be true but most of the time they’ll write Brexit. What remains fascinating about the slowest car crash in modern political history is that so little is known. Like the shipwreck in the Black Sea, its secrets are yet to be revealed. We know that the people voted to leave and the prime minister promptly left, later to turn up in a designer shepherd’s hut. History will judge that David Cameron deserved a punishment far worse than spending “me” time in a man cave. The pretenders to the crown started to wave for attention, then began to drown. Which left Theresa May making a speech while dressed in a Black Watch tartan trouser suit, making her look part headmistress, part extension of the carpet. Since then she has been cast as second best, a weak person. There is much to be discovered about the last two years, but the characterisation of May as feeble could be the most wrong. She inherited a duff hand. Within hours of the referendum result, the promise of £350 million a week to the NHS had been disowned, and two things had emerged which nobody ever spoke of in the campaign. The first was the fee to exit – a number which ranged across the billions like a child guessing at the stars in the sky. The second was the question of the UK border in Ireland. In response to this uncertainty and only holding a narrow majority in the Commons, which contained unreliable rebels, she called an election. That didn’t go well – she no longer had a majority and had to rely on Ulster unionists to keep her in office. She survived – somehow, against the odds, but in part because the story of Brexit has been that the Brexiteers are never as courageous as they sound. Ulster unionists are to negotiation what a hammer is to glass. Toddlers in the sweet aisle are more open to reason than Arlene Foster, whose first recorded word as a baby was no. But no one in the Tories had the nerve to challenge May, a spinelessness which continues to this day. 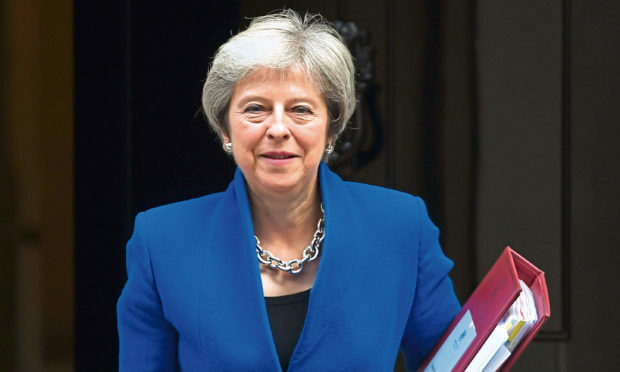 On June 17 2017 she stood up at Lancaster House, scene of many a famous declaration, and set out the negotiating objectives for the UK when exiting the EU. There were 12 points, each sufficiently woolly to be unobjectionable – though, of course, Brexit rebels objected. In December of that year she signed an agreement with the EU which has become known as the Irish Backstop – no matter what, the UK border in Ireland cannot become hard. It has made Britain seem a hostage of Ulster unionist intransigence – but it has also kept the negotiations going. In March of this year she spoke at the Mansion House in London, setting out five tests for a good Brexit. It is not clear if these were real, or just a way to force Tory rebels to sign up to the responsibility of what Brexit meant. Either way, she survived and the rebels chickened out. And then came Chequers, another attempt to get collective responsibility, which fell apart when David Davis resigned shortly afterwards, and Boris resigned on the grounds that he should have done so before Davis, but better late than never. And now we are 95% there, according to Downing Street and the EU’s negotiator Michel Barnier. Which 95% we don’t know. We assume it’s our border in Ireland and an extension of the transition period that’s yet to be set, but it could be so much else. This cuts to the heart of Brexit – a private deal done in the public glare, and audience baying for action from a performance behind a curtain. Yet, crucially, a show that has lasted a lot longer than anyone gave May credit for. She has appointed arch-Brexiteers to Cabinet and seen them fail, and resign. She is beleaguered with critics uttering vile remarks, yet is still the one in power. She seems to have stretched out the negotiation time, and quite possibly got close to the softest of all Brexits – a long transition, no dramatic walk-out. In the process she has seen her opponents, who would cast themselves as Churchillian leaders awaiting their destiny, as erratic mavericks, incapable of leading themselves, let alone a united Tory party. Should she fail at this stage, then what would flow from a Tory leadership campaign can only be worse. Brexit is still unknown, but the idea that May is weak, Boris is masterful and the EU is malicious does not stand up to scrutiny. For all we know, this could prove to be May’s finest hour, for which we will ever be grateful.